We look forward to working hard to put our new or repeat clients on fish this year! In January, we are expecting to see some of the migratory tarpon moving in around the islands. The tarpon fishing will get even better as we get into February and March. The tarpon fishing is good all the way through September. Permit fishing is good all year round as long as the weather is calm. Anglers can get shots at permit on a daily basis. We keep exploring some new grounds for shallow tailing permit and this also has been a success for us, so depends how windy it is the day we go out, that will determine where we will be fishing. Most permit can be found water that is 10 to 15 feet deep or in shallow water when they are tailing while feeding. Crab pattern flies work best. Around Caye Caulker, we have bonefish year round. Bonefish can be found in small schools or single tailing bonefish can be found on the flats. Best flies are small shrimp and crab patterns. Whether anglers flyfish or not, we are able to make them have a fun day, fishing for permit with live bait on a spinning rod. We guide experienced anglers as well as, novice anglers too. 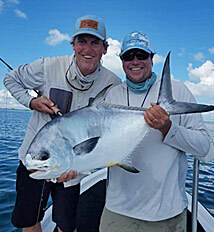 Even if you never caught a bonefish, permit or tarpon before you will have a fun day fishing with Chasin’ Tail. Chasin' Tail fly fishing team is comprised of four, top local guides. We look forward to having you in the boat and taking you fishing with us this year! 2018 was one of the best year ever we ever had fishing. Thank you to all our clients who made 2018 a successful year. Last year, many fly fishing anglers got their permit on a fly, some got their first grand slam, others got a super slam, while others got their first tarpon on a fly! Our biggest accomplishment was in August, 2018. Chasin’ Tail top guide Ken took second place in the largest Slam Flyfishing Tournament in Belize. 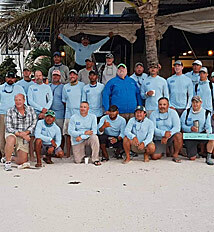 The Tres Pescados Slam Tournament on Ambergris Caye. Out of the 10 years the tournament has been held in Ambergris Caye, our best guide Ken has guided his team to win 5 times both first and second places. This is a big deal for us, as we are a small team of guides, going against 21 boats and guides in Ambergris Caye.